As a year past rolls around I can only think, “how have I not written about Nonno and March 2016 yet?” So, I’d like to finally devote some time and words for my aunt Toni’s sake and for the rest of my family as his one year without him rolls around and all of the feelings and memories come flooding back with force. 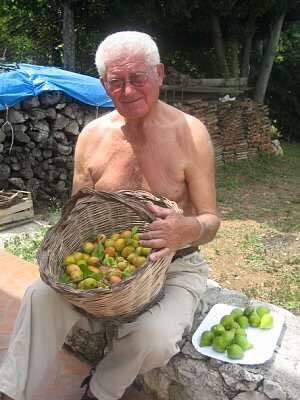 My Nonno Michele (Miguel) was an incredible man. His deep scratchy voice and chuckle resonates in my head whenever I think about him, and it keeps him alive. He is also kept alive by the memories of him holding court always at the head of the table, any table, no matter where we were. His particular and methodic way of peeling every apple, pear, peach and nectarine with a sharp knife, the missing half its handle and scratched up because he sharpened it himself, the fruit becoming half of what it originally was because of his skin peeling work, and him popping the fruit into his mouth or sharing it with us grandkids off the tip of the knife. His unique contraptions built from his own hands, tools and recycled scrap materials. His way of referring to my nonna as La Signora and arguing with her as often as possible. These are just a few of the things that characterize my day-to-day Nonno, but his story goes farther beyond his daily routines. My nonno was born in Fontechiari, Frosinone, Italy, in 1923. He grew up in a small hill town with little to nothing, growing up on the land and amongst his family and friends who lived nearby. My Nonno was 16 when World War II broke out, working as a Carabinieri at the Vatican he was soon enlisted in the Army under Mussolini’s rule, as with all of the eligible Italian men, there was no choice. 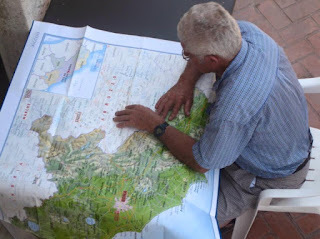 With the allied invasion of Sicily in 1943 and the fall of Mussolini, my Nonno was told to desert his company and go home, he slipped out of the back of the truck he was being transported in, and he walked all the way home to Fontechiari from Rome. Only god knows how he was able to find his way without being captured or getting lost. 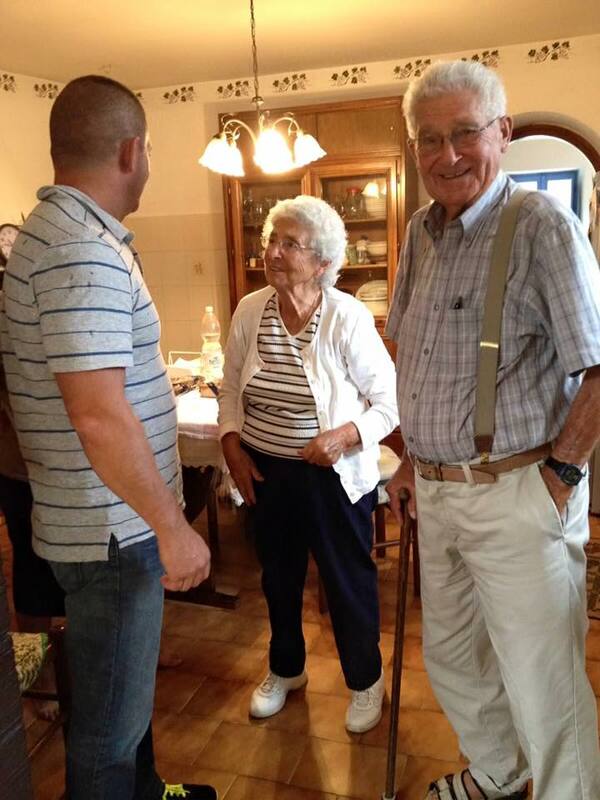 I don’t know the details, but sometime while living through the war he met and fell in love with my Nonna. They were both from the same neighborhood, within walking distance from each others homes, so finding each other was only a matter of time. They both lived in a very rural and remote part of Italy, with very few resources and survived by living off of the land and livestock they owned. The war only made things more complicated, impoverishing their town further when German's were forced to exploit their few resources to survive and living through a war zone, Montecassino just 25 miles away. With the conclusion of the war in 1946 it seemed only natural to find a way out of their impoverished town. The idea was to emigrate to America together and start their family there. Paying attention to detailed immigration laws, my grandparents were not married in Italy in order to allow my grandmother to travel to America as a minor under her father's papers. My Nonno was not so lucky given he was already over the age of 21. He was forced to stay behind in Italy while my Nonna headed to America to start a new life. In retrospect, I am sure my Nonno was giddy about the prospect of having to stay back in Italy a few years more, but he also knew that in order to get the best for his future family, America was the answer. In 1953, 4 years after my Nonna had moved to New York, my Nonno joined her. With their young daughter Anna, my Nonno and Nonna began to make their Italian American success story in the vibrant city of Schenectady, NY. The Italian community was everything to Italian immigrants in Schenectady at that time. GE was one of the main employers of immigrants, and the immigrant families worked together to support each other and thrive in their new foreign home. My Nonno was among the hard working blue collar folk who had learned useful skills back home in Italy and was able to apply those skills to start a business. He and his brothers started a construction company building anyone and everyone's house in Schenectady. I used to love driving through the neighborhoods of Schenectady having him point out all the different houses he built, then I would begin to guess which ones he might have built based off style. The house that they lived in for the majority of their life was also built by him and I love to point out where the tiles are mismatched on the floor or how the door frame seems to be a little crooked. Let's not even get me started on the blue plumbing in the bathroom, but I can only imagine all of his homes were fit with a retro blue toilet, tub and sink basin... oh the good ole days! My mom, aunts and uncle hold most of the details that describe this period of my Nonno's life. Thankfully over the years I've gained some insight into that life so I can characterize it rather accurately, but without great detail. Growing up in a house headed by him, he was your typical Italian father figure. He worked all of the time and so did my grandmother, but when he got home from work he sat at the head of the table, did not really help take care of the children, and waited to be fed. This was the way things were in the 50s and 60s, he loved his family, provided for them and made them laugh, but was definitely a different fatherly figure when comparing him to the father figure I had growing up. 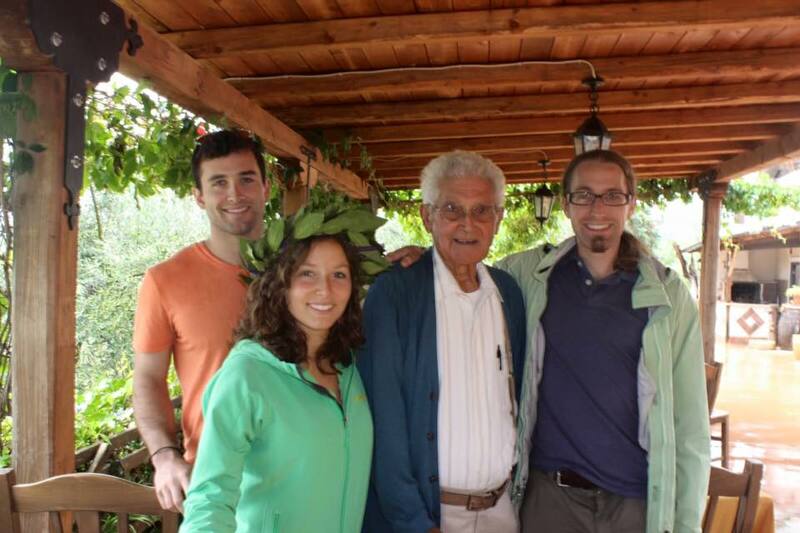 My ideas about my Nonno are naturally very different than my mom's, my aunt's and my uncle's. To me he was the red faced man sitting at the head of the table who loved to laugh, joke and chat up anyone who was willing to listen. He'd do this while he enjoyed a glass of red wine or two from his homemade stockpile or while tearing apart chicken thigh my Nonna had just prepared for him. Red meat was his favorite, and he was always part of the clean plate club, naturally also invoking the clean plate club rule on anyone who sat at the dinner table with him. It was my Nonno who taught me the beauty of la scarpetta, that amazing Italian creation of taking a delicious piece of bread and using it to mop up whatever kind of sauce might have been left behind on your plate; red sauce, meat sauce, garlic and oil, egg yolk etc. He always wore khakis, a button down shirt (his white Hanes undershirt peaking through) and suspenders. His daily routine included reading the newspaper at the head of the table. He read and read and read and highlighted important pieces of information meticulously... who knows what he did with all that information! When you saw him and he wasn't at the head of the table he must've been outside tinkering with his tractor or down the farm caring for his sheep, still in his khakis, but maybe he switched to his weed whacking boots and removed the button down to be in his cannotiera, Hanes tank. He criticized his kids for not teaching his grandkids how to be a proper Italian and speak the Italian language. He was stubborn as heck, extremely intelligent, loved working with his hands and being creative, spent every minute he could outside and busy and was extremely frugal and resourceful. I can't forget to mention that he was maddening and frustrating to my mom, aunts and uncle, but loved us like no one else. As I got older and we began to travel to Italy to stay at the family home he grew up in and never abandoned, I began to understand another side of him, a side that inspired me and influenced me towards the thing I am most passionate about in life today. Going to Via Muto, Fontechiari, Provincia di Frosinone was a part of my summers since I was 6 years old, that at times I appreciated and at times I took for granted (my teenage years, ha!). My Nonno and Nonna spent the entire summer at Via Muto, it was their second home, and the home that you could tell brought them real happiness. 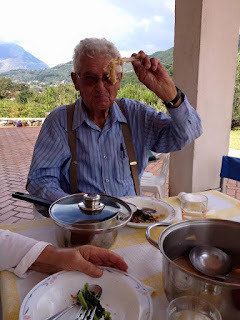 From New York to Italy, my Nonno's habits did not change all that much, he still sat at the head of the table, wore his khakis, button down and suspenders, tinkered with tools, read il giornale, joked and entertained his guests, but you could tell something was different. We'd arrive at Via Muto to see Nonno out in the field doing god knows what, he'd come greet us at the car, he'd be so tanned and healthy looking from spending all his time in the sun, we'd notice a basket of figs drying in the sun and his grin stretching from ear to ear because Muto was his place and now his family was there with him. He'd start yelling something in dialect/Italian/English and embrace us then go right back to whatever he was working on before we came. Neighbors would show up to sit down on the patio outside with him and share jokes and Peroni's. This was the life he loved the most and I was blessed to have shared that love with him. You have to understand that Nonno Michele was a tough man. He was stubborn, definitely favored the boys in the family and favored others for various reasons. I know everyone craved his attention and I was one of them. When we started to take language in Middle School, I wanted to take Italian so I could converse with my grandparents and more importantly impress my Nonno. My schools never offered Italian which made that a challenge, but I had a knack for languages and even without taking Italian could already understand when my Nonno spoke dialect to me. Throughout high school my trips to Italy had a love hate relationship, me being a moody and selfish teen and all, but in college the tables started to turn. 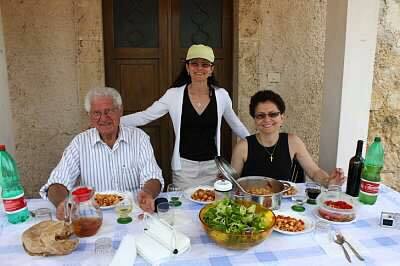 My parents were no longer forcing me to go on vacation with them to Italy (wow, I sound like a jerk), and I began to miss the culture my Nonno had taught me to love without even realizing it. I missed it so much I knew I had to go abroad to Italy ASAP. I researched a million ways to get to travel to Italy with school for longer than a trimester, but between having a diving career and Union squashing all of my efforts for monetary reasons, I ended up applying for a trimester abroad in Florence Italy, but I didn't wait until my Junior year like everyone else, I went after it my sophomore year and I got accepted to the program! Grazie dio! The winter before we left for the term abroad I took my first Italian language class with Professoressa Keyes (she is the best!). I was a natural and for the first time I could go visit my Nonno and impress him with what I had learned! He was impressed... but not for very long! Spring came and I packed my bags for Florence, my term abroad had many ups and downs, but ultimately I fell in love with the country my Nonno had always been in love with. I understood and appreciated the frustrations of Italian life and became so passionate about the culture and love for family, art, food and simplicity that emanated from every cobblestone, every cigarette smoker and every barista I passed daily for 10 weeks. I learned that Italy is beauty, love and passion. I fell in love and couldn't stay away. From that point on, March 2010, Italy was on my mind constantly. I improved my language so much in those 10 short weeks that when I followed my semester abroad with 2 weeks at Muto I was able to show off what I had learned to my Nonno. He was impressed and happy that I was finally understanding the passion for his birth country, but still disappointed when I didn't quite understand things he was saying. Naturally, I wanted to continue taking Italian classes, travel to Italy as often as possible, and find any which way to get back. That Fall my friend Drew was studying in Rome and I booked a ticket to visit with him over Thanksgiving. Things fell apart and I wasn't able to go, so I rebooked in Spring 2011 with my college friend, Lexi. For months, since I had left Italy I had been researching internship opportunities and looking for a way to get back to Italy for this Summer of 2011. On my vacation with Lexi I had secured an interview at a company that a Union Alumni started in Rome. It was one of the first days we spent in Rome, my appointment was in the morning, I left Lexi to hang out while I navigated with the metro all the way to the Aircom International office a bus ride away from the Laurentina metro station...I had never ventured this far in Rome by train! My Italian was subpar, but I met with the director in the office, met the few employees who worked in the office and then was quickly talking about the steps I needed to take to move to Rome for the summer, I got the job! 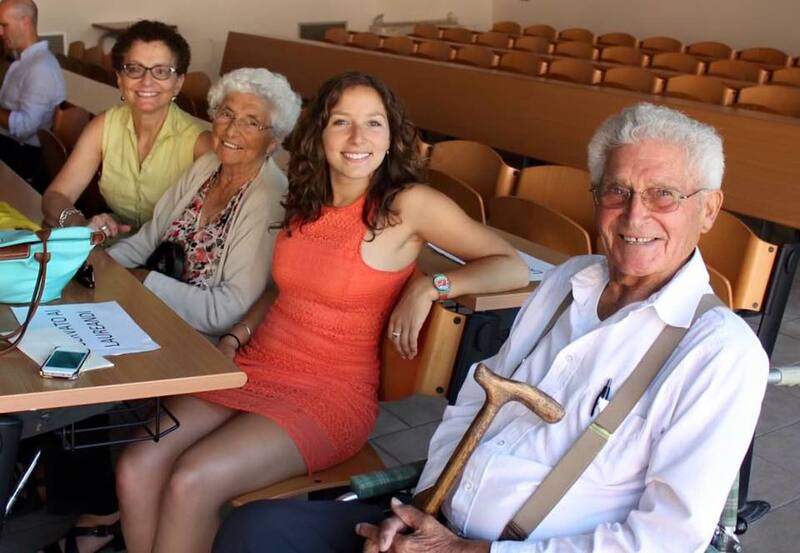 My summer in Rome was fabulous and allowed me to spend a lot of time with my grandparents as I could just hop on the train and be in the hills of my Nonni's home in an hour and a half. My Nonno and I really began to bond in these days. Although I had learned to drive stick in high school, I never had all that much time to practice my Italian hill driving, especially under the direction of Nonno in the FIAT Uno-45. The weekends spent with him and my Nonna were an adventure. We'd sit outside as much as possible, I'd help him with yard work and then Toni and I would be enlisted in his to-do list of tinkering, hopping in the FIAT and driving him around wherever he fancied. We'd go to festas at night, met his friends, convince him only to eat one piece of sausage, guess the height of the prosciutto and have many laughs. It was probably my favorite summer without a doubt. I was lucky to spend every weekend with my grandparents, but while it was a blast I also learned that my Nonno was stubborn as stubborn could be. We'd get in the car with a mission at hand, pipes or curtains, he'd have me drive around from store to store, get out of the car, go in the store and ask a million questions to the clerk that he needed answered. "Lia, go out and ask the man if he has tubes that are an inch and a half wide, and how much it would cost for 200 meters of tubing." "Lia, stop here on the left, my friend Vincenzo lives here, go ring the doorbell and ask if he knows the man who sells the car insurance and ask him how to give a car away for free and how to pass the title of the car to someone else." "Lia, I want that pizza from Posta Fibreno, but they make it in Alvito, call this man and tell him we need it by 2:00pm, just tell them your Nonno asked you to call." Keep in mind, at this point my Italian was not fabulous, I was 21 years old, and my Nonno had me running into people's houses I didn't know asking questions about house remodeling, water access from the government, car titles, selling cars, buying cars, tubing water from a cistern etc. And once we asked the question to one person, it wasn't enough, we needed answers and we needed to ask everyone he knew might have some kind of information. It was like his own way of googling answers, but it was a lot harder and more time consuming. He did the same with my Nonna and with Toni and they were always in an argument over something, so things got quite tough at times that summer, but I'd also never give it up for anything. Although there was stress and arguments, it was exactly those times when we were out running errands, when we sat on the patio with home cooked food from Nonna and a glass of wine that made it all worth it. I can only smile and laugh when I think about the crazy errands he sent me on and what he taught me about how to get things done in Italy. Additionally, My Nonno loved telling stories, especially about his life in Italy. I'd ask him so many questions about the neighborhood and growing up there and he'd just spit out story after story. I'd sit there when Gino or Bernard came by and just listen to what they talked to each other about, again stories and memory after memory came spilling out. 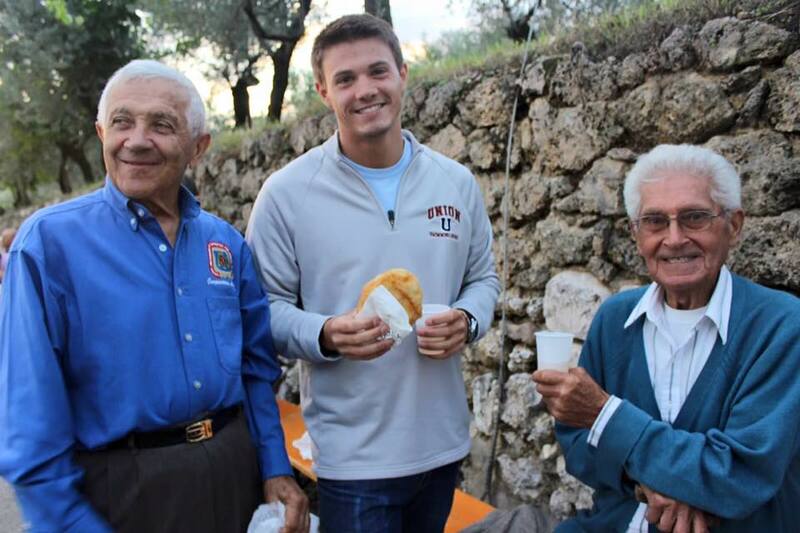 These were the priceless moments that I'd never give up and would have never been in the position to understand or witness if I hadn't developed the passion for Italy that stemmed from my Nonno's. It was the best summer of my life, full of demands, swears, stories, memories, Italian language, Italian sun, Italian food, and Italian culture. It also further solidified my need to return to Italy and my need to impress my Nonno with my language skills even more. Following graduation from Union I had a crazy idea to go back to school in Italy. 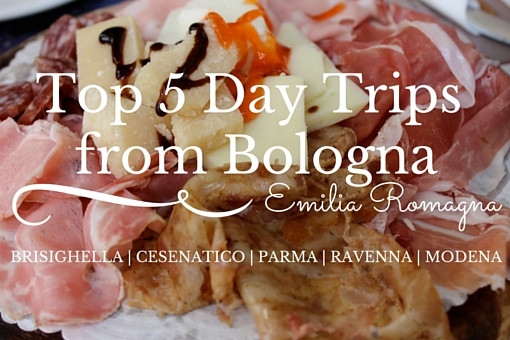 I was sitting in an archiving room all summer, dreaming about Italy and what I was missing. When I wasn't archiving, I was googling solutions for my Italy withdrawal. After a lot of difficulty and roadblocks, the solution became clear, L'università di Bologna, Laurea magistrale (masters degree). My Nonno was so thrilled to hear that I would be moving to Bologna to study. You could see his eyes light up just thinking about it, he would always remind me that I'd be in the city of Lucio Dalla, and that he had been to Bologna just once, passing through the train station during the war. He'd heard about Piazza Grande and imagined it's beauty and knew he wanted to return, and was sure he'd return to see it when I completed my degree course and graduated. Over my two years in Bologna, my bond with my Nonno grew. Everyday I encountered new experiences that frustrated me and that made me love Italy and it's crazy ways even more. I learned the quirks of the system and began to understand and speak the language better than my mom, my aunts and uncle. I had an even greater connection with my Nonno than ever before, we always saw each other light up with joy when speaking about Italy, and now I was capace to help him finish his dreams of remodeling my Nonna's home on top of the hill. As my two years at Bologna continued, my Nonno turned 90 years old. He was getting older and starting to feel it in his mobility. In July 2014, my graduation from Bologna was planned. Both my Nonni were in Italy for the summer and we made big logistical plans for how to get drive them up to Bologna comfortably. Everything was going well as planned until my Nonno took a big fall at Muto two days prior to traveling to Bologna. We weren't sure he was going to be able to make it. But stubborn and strong minded as he is, he pulled himself together, bandaged and bruised, because he was going to make it to Bologna to see Piazza Grande, Lucio's house and his granddaughter graduate with an Italian degree. My time spent with my Nonno, my family and my support circle in Bologna at my graduation was something incredible like I'd never felt before. Defending my thesis in front of the graduation board in Italian made my Nonno giddy and everyone so proud, including myself! It was the most special time of my life to date and I was fortunate enough to have had everyone make it to see, especially my courageous Nonno Michele. Lia, this is so beautiful. Nonno would be so proud. He would read this 20 times and highlight the best parts and make notes in the margins. I especially like the paragraph about running into peoples homes and businesses to ask questions and get info ... sort of reminded me of Mom's demands on you at times ... :) ... runs in the family I guess. Well done Lia, I really enjoyed the read!! Wow...so so beautiful.... reading this has turned my annoying morning at work into a beautiful day. Happy happy memories and zizi Linda is right, he would be rereading this forever and keeping in a special folder on the window sill next to the front door.